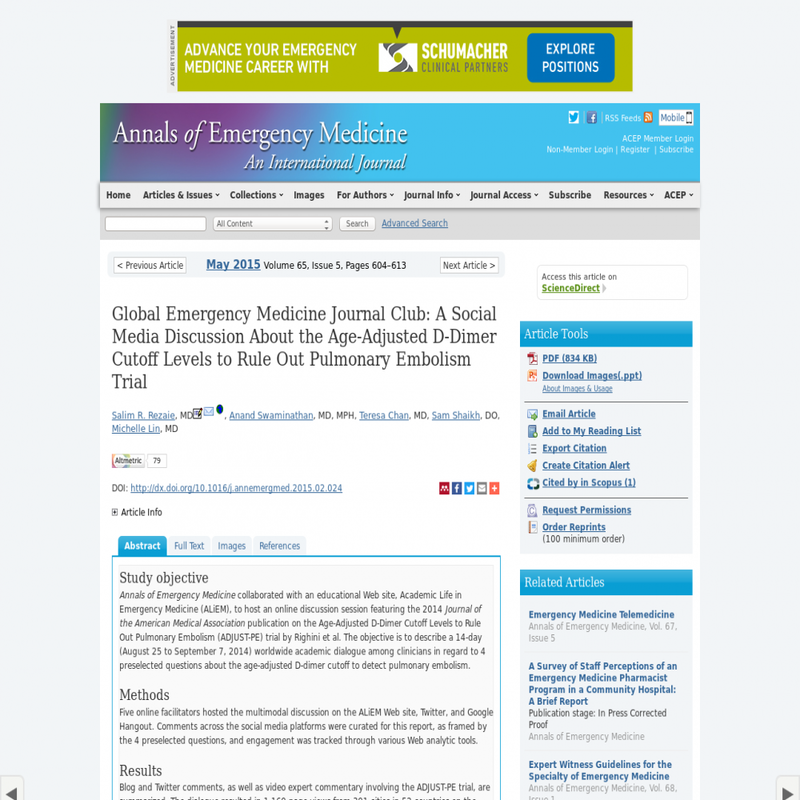 Annals of Emergency Medicine collaborated with an educational Web site, Academic Life in Emergency Medicine (ALiEM), to host an online discussion session featuring the 2014 Journal of the American Medical Association publication on the Age-Adjusted D-Dimer Cutoff Levels to Rule Out Pulmonary Embolism (ADJUST-PE) trial by Righini et al. The objective is to describe a 14-day (August 25 to September 7, 2014) worldwide academic dialogue among clinicians in regard to 4 preselected questions about the age-adjusted D-dimer cutoff to detect pulmonary embolism. Five online facilitators hosted the multimodal discussion on the ALiEM Web site, Twitter, and Google Hangout. Comments across the social media platforms were curated for this report, as framed by the 4 preselected questions, and engagement was tracked through various Web analytic tools. Blog and Twitter comments, as well as video expert commentary involving the ADJUST-PE trial, are summarized. The dialogue resulted in 1,169 page views from 391 cities in 52 countries on the ALiEM Web site, 502,485 Twitter impressions, and 159 views of the video interview with experts. A postdiscussion summary on the Journal Jam podcast resulted in 3,962 downloads in its first week of publication during September 16 to 23, 2014. Common themes that arose in the multimodal discussions included the heterogeneity of practices, D-dimer assays, provider knowledge about these assays, and prevalence rates in different areas of the world. This educational approach using social media technologies demonstrates a free, asynchronous means to engage a worldwide audience in scholarly discourse.